This article is about the Interstate highway in Texas. For the loop in Austin, Texas, see Texas State Highway 45. Interstate 45 (I-45) is an interstate highway located entirely within the U.S. state of Texas. While most interstate routes ending in five are cross-country north-south routes, I-45 is comparatively short, with the entire route located in Texas. It connects the cities of Dallas and Houston, continuing southeast from Houston to Galveston over the Galveston Causeway to the Gulf of Mexico. I-45 replaced US 75 over its entire length, although portions of US 75 remained parallel to I-45 until its elimination south of downtown Dallas in 1987. At the south end of I-45, State Highway 87 (formerly part of US 75) continues into downtown Galveston. The north end is at Interstate 30 in downtown Dallas, where US 75 used the Good-Latimer Expressway. A short continuation, known by traffic reporters as the I-45 overhead, signed as part of US 75, and officially Interstate 345, continues north to the merge with the current end of US 75. Traffic can use Spur 366 to connect to Interstate 35E at the north end of I-345. The portion of I-45 between downtown Houston and Galveston is known to Houston residents as the Gulf Freeway. The short elevated section of I-45 which forms the southern boundary of downtown Houston is known as the Pierce Elevated, after the surface street next to which the freeway runs, while north of Interstate 10 it is known as the North Freeway. I-45 and I-345 in the Dallas area, north of the interchanges with Interstate 20 and State Highway 310 (old US 75), is the Julius Schepps Freeway. The Gulf Freeway and North Freeway both include reversible high-occupancy vehicle lanes for buses and other high-occupancy vehicles to and from downtown Houston. In addition to the official control cities of Galveston, Houston, and Dallas, I-45 serves a number of other communities, including La Marque, League City, Spring, The Woodlands, Conroe, Willis, Huntsville, Madisonville, Centerville, Buffalo, Fairfield, Corsicana, and Ennis. U.S. Highway 190 joins I-45 for 26 miles (42 km) from Huntsville, Texas to Madisonville, Texas. U.S. Highway 287 joins I-45 for 18 miles (29 km) from Corsicana, Texas to Ennis, Texas. US 287 signs are only posted (with I-45) from the northern end of Business Loop 45 in Corsicana to the Ellis County line. Interstate 45 gained notoriety during Hurricane Rita in 2005. Thousands of Houston area evacuees jammed the roadway trying to leave. As a result, the freeway became a parking lot. Gas stations ran dry and hundreds of people's cars simply ran empty, their occupants having to spend the night along the shoulder. Four-hour drives suddenly became 24-hour drives. 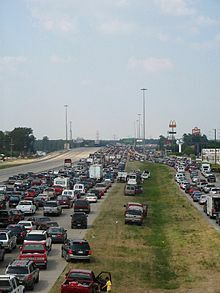 Even though the Texas Department of Transportation started contraflow lane reversal at FM 1488, it did not alleviate the traffic jam deep into the city, as that starting point was even north of The Woodlands, which is close to Conroe, the northern terminus of the greater Houston area. At just 284.913 miles (458.523 km), I-45 is the shortest of the primary interstates (ending in 0 or 5), and the only primary interstate to be entirely inside of one state. The stretch of I-45 connecting Galveston with Houston is known as the Gulf Freeway. It was the first freeway built in Texas—opened in stages beginning on October 1, 1948, up to a full completion to Galveston in 1952, as part of U.S. Highway 75. At the north (Houston) end, it connects to the North Freeway via the short Pierce Elevated, completed in 1967. The section north of the curve near Monroe Road/State Highway 3 in southeastern Houston was built on the right-of-way of the former Galveston-Houston Electric Railway, which entered downtown on Pierce Street. After several interchanges, I-45 crosses the Galveston Causeway and passes Tiki Island. Old U.S. Highway 75 south of this junction was upgraded on the spot. The Gulf Freeway generally parallels State Highway 3 (old US 75) about 1 mile (1.6 km) to the west, bypassing La Marque, Dickinson and South Houston. It includes interchanges with several other freeways: the Emmett F. Lowry Expressway (Farm to Market Road 1764), NASA Road 1 Bypass and the Sam Houston Tollway, meeting the north end of State Highway 3 in southeastern Houston. (This part of SH 3 — on Winkler Drive and Monroe Road — is not part of old US 75.) A center reversible HOV lane begins just south of the Sam Houston Tollway. In Houston, I-45 meets Interstate Highway 610 and State Highway 35 at a complicated interchange. At the merge with Spur 5, a short freeway spur to the University of Houston, elevated collector/distributor roads (also part of Spur 5) begin. The C/D roads and the HOV lane end at Emancipation Avenue, the original end of the Gulf Freeway. Just past Emancipation Avenue is an interchange with Interstate 69/U.S. Highway 59 (Eastex Freeway and Southwest Freeway) and State Highway 288 (South Freeway), after which I-45 technically becomes the North Freeway as it runs along the northwest half of the block between Pierce Street and Gray Street as the Pierce Elevated. The HOV ends approximately one mile north of the Cypress Creek Parkway (FM1960) exit and becomes a diamond white line at grade separated HOV north to just before exit 84 Loop 336 on the south side of Conroe. This provides HOV access 24 hours a day 7 days a week with one lane on the northbound side and one lane on the southbound side with periodic dotted lines for access at major exits. The stretch of I-45 along the Julius Schepps Freeway in Dallas, from the Trinity River to Downtown Dallas up to and including the I-345, is elevated above the surrounding areas for most of its length. As such, when ice storms hit the Dallas area (usually on average 1-2 times per year), the freeway is shut down, and traffic is diverted to State Highway 310 and U.S. Highway 175 which parallel I-45. In the initial assignment of state highways in 1917, Dallas-Fort Worth and Houston were connected by a branch of State Highway 2 (the Meridian Highway), which ran via Waco and Bryan and continued on to Galveston. The more direct route followed by I-45 was not initially part of the system between Richland and Huntsville; this cutoff was added by 1919 as State Highway 32, and U.S. Highway 75 was assigned to the alignment in 1926. Prior to the coming of the Interstate Highway System in the late 1950s, the only improvements to US 75 in Texas beyond building a two-lane paved roadway were in the Houston and Dallas areas. However, the highways in and near these cities included some of the first freeways in the state: the Gulf Freeway (Houston) and the Central Expressway (Dallas). The Galveston-Houston Electric Railway began operating an interurban between those cities on December 5, 1911, and last ran on October 31, 1936, though the Houston Electric Company, operator of Houston's city transit system, continued to run trains on the portion between downtown and Park Place. 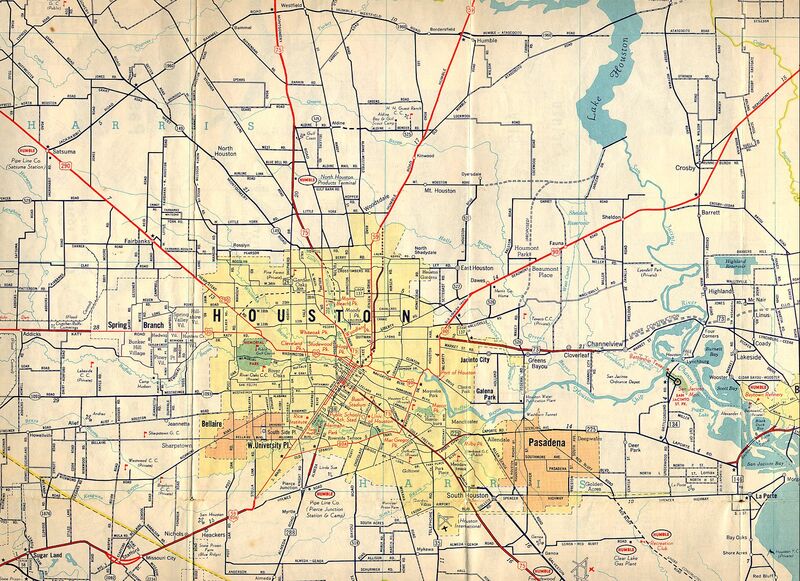 A proposal for a "super-highway" between the cities was first made in 1930, and Houston Mayor Oscar Holcombe began to work towards it later that decade. He announced an agreement with the Houston Electric Company on April 12, 1940, through which the company could convert its four remaining lines to buses, in exchange for the right-of-way used by the Park Place line. This line was last used on June 9, 1940, the last day of streetcar service in Houston; the replacement is still operated by METRO as the 40 along Telephone Road. Before the new highway was built, U.S. Highway 75 followed Galveston Road (now mostly State Highway 3), Broadway Street, and Harrisburg Boulevard into downtown Houston. State Highway 225 carried traffic from La Porte along La Porte Road to US 75 in Harrisburg, and State Highway 35 connected Alvin with downtown Houston along Telephone Road and Leeland Street. 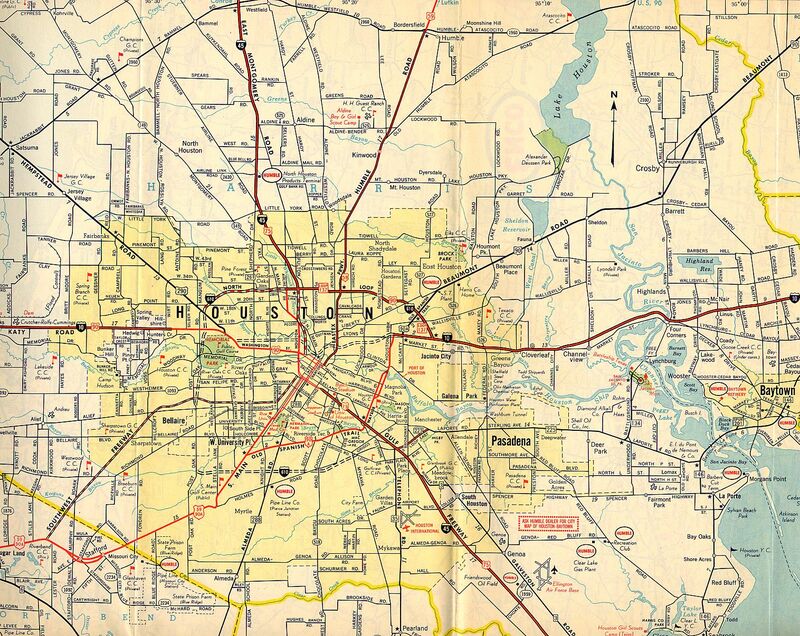 Plans made in October 1943, when the Texas Transportation Commission signed an agreement with Houston and Harris County, referred to the new bypass as a relocation of US 75. Drawings were released by the state on January 31, 1946, and included almost continuous frontage roads, broken only at railroad crossings. Although the freeway ended at Live Oak Street, a so-called "four-street distribution system" of four one-way streets, timed for 30 miles per hour (50 kilometers per hour), carried traffic to Main Street. Initially, the two southwestern streets — Pierce Street and Calhoun Avenue (now St. Joseph Parkway) - carried traffic towards the freeway, and the other two — Jefferson and Pease Streets — carried exiting traffic; once the freeway was completed far enough to allow US 75 to be marked along it, Pease and Pierce Streets carried that highway to Fannin Street. The first freeway dedication in the state took place at 7 p.m. on September 30, 1948, at the overpass over Calhoun Road by the University of Houston. The roadway between downtown and Telephone Road was opened to traffic after speeches, but lacked an official name, being called the "Interurban Expressway", after the rail line that it replaced, by the press. Mayor Holcombe quickly started a contest to assign a name, and the city chose the winning entry on December 17, 1948. Sara Yancy of Houston Heights won $100 for her submission of "Gulf Freeway", named for the Gulf of Mexico that the highway would reach when completed. The freeway was extended to Griggs Road in February 1951, Reveille Street (onto which SH 35 was realigned) in July 1951, and was completed to the Galveston Causeway on August 2, 1952, with a ceremony on the bridge over Farm to Market Road 517 near Dickinson. However, beyond Reveille Street, the road was not built to freeway standards, with 32 at-grade intersections, though no traffic signals. The highway curved away from the old interurban right-of-way near Monroe Road, about where the Park Place streetcar line had ended. In December 1952, a short spur, now part of Interstate 610, was opened to connect with SH 225. A three-way split in the northwest part of Park Place, near where Gulfgate Shopping Center opened in 1956, carried non-stop traffic to and from SH 35 and SH 225. This split was also the location of a lane drop; the roadway carried six lanes (three in each direction) between Houston and the interchange, and four beyond to Galveston. After the new US 75 was completed, the old road between downtown and South Houston was dropped from the state highway system, while the remainder became State Highway 3, connecting to the Gulf Freeway via Winkler Drive, effective August 20, 1952. The first major change was made in preparation for the North Freeway connection, when the directions of Calhoun Avenue and Jefferson Street were swapped so that they would alternate. A bridge, dated 1954, was built to carry traffic from Jefferson Street over traffic to Jefferson Street, and US 75 was moved to Calhoun Avenue northbound, soon crossing downtown on the one-way pair of Calhoun Avenue and Pierce Street to the new North Freeway. A median barrier was added in 1956 to prevent crossover accidents. Southeast of downtown Houston, the at-grade intersections proved dangerous, and only two had been replaced with interchanges by 1959, when the Texas Highway Department began a program to upgrade the road to full freeway standards. Frontage roads would be required along the entire highway, since the state had not purchased access rights, and so abutting property owners were able to build driveways to the road. To accomplish this, traffic was shifted to the newly built frontage roads so that the central main lanes could be reconstructed. This grade separation was completed from Houston to Almeda-Genoa Road (exit 34) in June 1959, Farm to Market Road 1959 (exit 30) in October 1964, Farm to Market Road 518 (exit 23) in December 1970, and Farm to Market Road 1764 (exit 15) in 1976. As the section beyond FM 1764 into Galveston had already been rebuilt, this marked the completion of the Gulf Freeway as an actual freeway. As the first freeway in Texas, the standards of the Gulf Freeway soon became inadequate, with poor sight lines and little room to merge when entering. It also attracted development, such as Gulfgate Shopping City, the first mall in the Houston area, the Manned Spacecraft Center, and many residential developments. Heavy congestion began to affect the freeway by the early 1960s; two roughly parallel freeways — the Harrisburg Freeway and Alvin Freeway - were proposed at that time to relieve the traffic, but were not built. A short project to widen the road to six lanes between I-610 and Sims Bayou was completed in 1960, and ramp meters were installed in 1966. The I-610 interchange was rebuilt with direct connections for most movements in 1975. Plans to reconstruct the freeway near downtown began in 1972, taking about 170 houses and 22 businesses from the southwest side for the room to expand the main lanes and add parallel lanes for the Alvin Freeway. Local opposition was unsuccessful at stopping the project, and construction on this segment, and others to the southeast, took place in the 1980s. The lanes were shifted outward to make room for the transitway, which opened to I-610 on May 16, 1988. These lanes were inspired by the similar ones on the Shirley Highway in the Washington Metropolitan Area. That year also marked the end of the reconstruction inside I-610, along with the elevated distribution lanes alongside the main lanes near downtown; the first short piece of the Alvin Freeway was finally connected to these in 1999. This project gave I-45 its current configuration, mostly eight main lanes wide, from Sims Bayou past I-610 to Griggs Road in 1981, to Telephone Road in 1982, to Lockwood Drive in 1985, and finally to downtown in 1988. However, this was not the end of construction on the Gulf Freeway. The highway beyond I-610 to FM 1959, which had just been upgraded in the 1950s and 1960s, saw an extension of the transitway to a temporary end near FM 1959, widening to eight lanes, and a large stack interchange at the Sam Houston Tollway. This reconstruction was completed between Almeda-Genoa Road and College Avenue in 1991, between College Avenue and Sims Bayou in 1994, and finally, in 1997, there was no construction anywhere on the entire length of the freeway when the tollway interchange was opened, along with the widening between Almeda-Genoa Road and FM 1959. 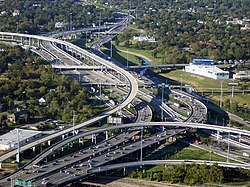 A 1999 study recommended widening the entire stretch from the Sam Houston Tollway to Galveston to at least eight lanes. Construction to replace the Galveston Causeway began in mid-2003, and work on a section through Webster, including a new interchange with the NASA Road 1 Bypass, began in mid-2007. Widening of the freeway between Kurland Drive at Bay Area Boulevard began in July 2011. This construction will expand the number of freeway lanes from six to ten, and increase the number of frontage lanes from four to six. The high occupancy vehicle (HOV) lane will be extended to the southern end of the construction. It will also involve rebuilding the overpasses at Dixie Farm Road and Clear Lake City Boulevard. (Dixie Farm Road bridge demolition has already been completed)  The project is expected to take five years to complete. According to the Texas Department of Transportation, the project is approximately fifteen miles in length, starting at Kurland and ending approximately one mile south of Bay Area Boulevard. The project has six phases. Phase one is the reconstruction of the main lanes from the northern end of the project to just south of FM 1959. The end of this phase will include the demolition and reconstruction of the bridge at the FM 1959 intersection. Phase two, planned to begin in mid-2012, will be the reconstruction of the frontage roads from just south of FM 1959 to the southern end of the project. Phase three will be the reconstruction of the main lanes on the southern half of the project, and is planned to begin in mid-2013. Phase four, scheduled to start late 2014, will be the demolition and reconstruction of the overpass at Clear Lake City Boulevard. Phase five, (which was completed) was the demolition and reconstruction of El Dorado Boulevard, and Bay Area Boulevard. The demolition and reconstruction was finished in 2016. As a result, the 1960s-era cloverleaf interchanges (with the exception of Fuqua Street and Scarsdale Boulevard) have been eliminated with overpasses. Phase six, will be making the new lanes of the freeway. It will have 5 lanes each direction along with the new overpasses for those two underpasses. This will be completed 2017. In 2015, reconstruction and widening of I-45 began in Downtown Houston due to heavy traffic. The SB on-ramp from Allen Parkway will be moved to enter on the right side, and long-range plans call for the demolition of the outdated Pierce Elevated, with the reroute of I-45 being along Interstate 69/U.S. Highway 59 and Interstate 10/U.S. Highway 90 to the North Freeway; The parts of the Gulf Freeway at I-10 and 45 will be known as the Downtown Connector. If the rerouting of I-45 with the Pierce Elevated demolition (and/or redevelopment into the proposed Pierce SkyPark as part of additional greenspace), the connecting ramps south of Allen Parkway would become a second downtown spur, which will result in the demise of a full freeway loop around Downtown Houston (this will make Dallas, TX the only Texas metropolitan area to retain its downtown freeway loop with Interstates 30, 35E, 345, and Spur 366); as of 2018 there are no plans to place the Pierce Elevated in a tunnel similar to Spur 366 in Dallas since the Houston Metro area is prone to flooding, especially the aftermath of Hurricane Harvey. 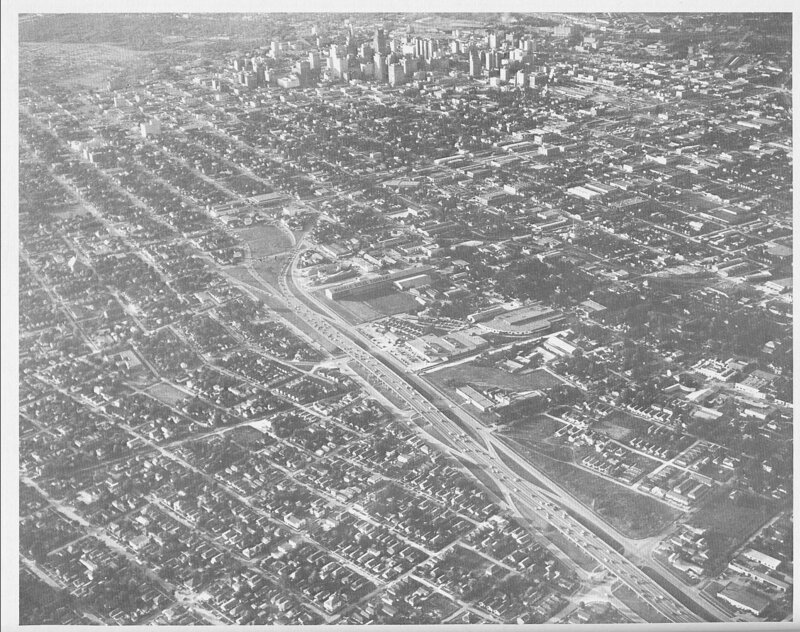 The last alignment of US 75 before the North Freeway was built left downtown Houston to the northwest on Main Street, turning north at Airline Drive, and then northwest along the present alignment of I-45, then known as Stuebner Airline Road, Shepherd Drive, and East Montgomery Road. The freeway replacement was authorized in stages between May 1945 and June 1952, when the Texas Transportation Commission adopted plans for a freeway all the way between Houston and Dallas. The North Freeway name was adopted in 1956; an unsuccessful proposal in 1965 would have renamed it the Dallas Freeway. The first short piece of the freeway to open crossed Buffalo Bayou, connecting the two one-way pairs from the north end of the Gulf Freeway with the south end of Houston Avenue. This was opened on December 12, 1955, and allowed US 75 to bypass its run on Main Street; it included interchanges with Allen Parkway and Memorial Drive. The next piece near downtown opened on July 24, 1962, leaving the 1955 freeway in the Allen Parkway interchange, passing east of Houston Avenue, and connected to an already-built portion at I-610. The six-lane Pierce Elevated, which occupies half a block on the southwest side of Pierce Street, required the acquisition of a number of commercial properties; the cost prevented the full block from being used. This portion opened on August 18, 1967, connecting the Gulf and North Freeways and bypassing the "four-street distribution system", which remains in its original form to this day. 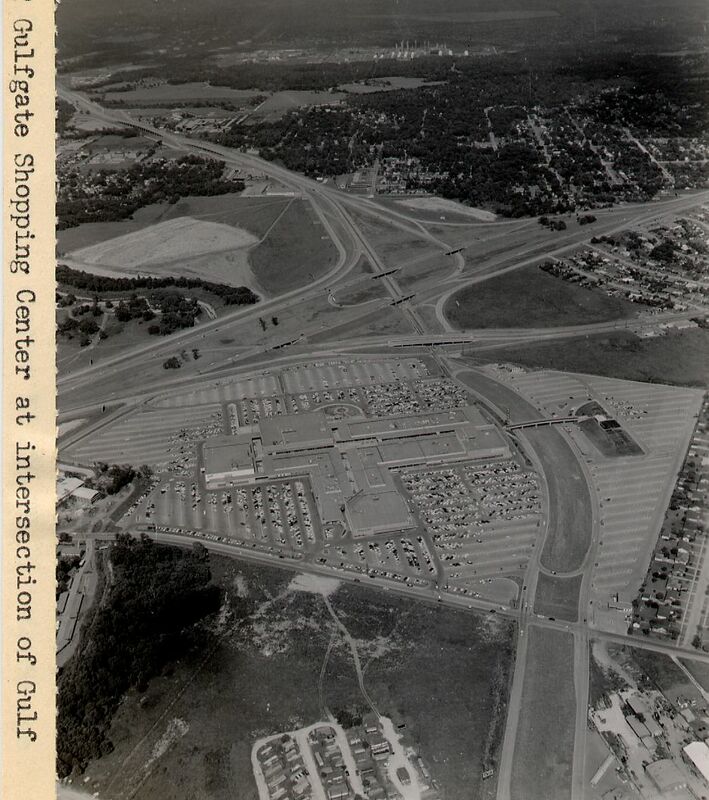 The first piece of the North Freeway to be built outside I-610 was an upgrade of existing US 75 on Stuebner Airline Road, between Airline Drive and Shepherd Drive, opened in December 1959. In April 1961, this was completed to the interchange with I-610, and on July 24, 1962 the downtown section was extended north to meet it. As each section opened, US 75 was moved to it, temporarily using I-610 to Airline Drive for about a year. At the other end, US 75 was upgraded from Spring Creek at the north edge of Spring north to the San Jacinto River south of Conroe in 1960. In between, the upgrade was completed from Farm to Market Road 525 to near Richey Road in December 1961, south to the 1959 segment in February 1963, and north to the 1960 segment in March 1963, completing the North Freeway except for the Pierce Elevated (1967). The freeway as initially built had eight lanes (four in each direction) between downtown and I-610, six to Farm to Market Road 1960, and four north of FM 1960. Like the Gulf Freeway, the North Freeway soon became congested. The oil boom of the 1970s resulted in large-scale residential development along the highway, most notably The Woodlands. Since the corridor was strongly directional, with 65% of peak-hour traffic going in the peak direction, a 9.6-mile (15.4 km) contraflow lane for buses and other high-occupancy vehicles (HOV) was implemented later that decade, opening on August 28, 1979 between downtown and Shepherd Drive (exit 56B). The facility, operating during both rush hour periods, occupied the leftmost lane of the other direction, and was separated from the other lanes with a movable pylon every 40 feet (12 metres). In 1980, the existing center breakdown lanes were restriped for HOV traffic for about two miles (3.2 km) from the north end of the contraflow lane. However, off-peak traffic was increasing, and construction began in 1983 on a more permanent reversible transitway in the median. This, the second transitway in Houston (a month after the one on the Katy Freeway), opened on November 23, 1984, replacing the contraflow lane. Reconstruction of the main lanes and frontage roads to handle increased traffic began in 1982 just north of downtown. No lanes were added south of I-610, but the eight-lane cross section, with room for a transitway, was continued north as construction progressed. Work was completed south of Airline Drive (exit 53) in about 1985, to Shepherd Drive (exit 56B) in 1987, and to Farm to Market Road 525 (exit 60A) in 1990; this last opening allowed the transitway to extend to just south of FM 525. The Hardy Toll Road, completed on June 28, 1988 between I-610 and I-45 near The Woodlands, added capacity to that part of the corridor, and in 1990 reconstruction was completed on a short piece of I-45 from the toll road into The Woodlands. Reconstruction continued from FM 525, reaching Airtex Boulevard (exit 63) in 1997, including part of the Sam Houston Tollway interchange (completed in 2003) and a transitway extension, Cypresswood Drive (exit 68) in 1998, extending the transit way to its present terminus, and the Hardy Toll Road (exit 72) in 2003. Work on the section through The Woodlands to Research Forest Drive (exit 77) was completed in 2001, including a direct connection to Woodlands Parkway, and in 2003 work was completed to Farm to Market Road 1488 (exit 81). Construction is now complete between FM 1488 (Exit 81) to the Walker County line near milepost 100 just south of the northbound truck weigh station and New Waverly, near State Highway 75 (exit 98). As of 2015, widening of the North Freeway from Downtown Houston to Sam Houston Tollway began; The plan for the project is to widen the freeway by adding managed lanes and adding the North Shepherd on and off ramps also known as Texas State Highway Spur 261 (which was already completed) prior to the I-45 widening project. The first part of I-45 between Conroe and Richland was the bypass around Huntsville. The final piece of I-45 between the cities opened on October 13, 1971, for 12 miles (19 km) between Fairfield and Streetman. The Central Expressway was the first freeway in Dallas, built as a new alignment of US 75. It first opened between San Jacinto Street and Fitzhugh Avenue in 1949, and soon stretched south to Hutchins. However, the stretch through downtown ran along the surface, as did the part south of the bridge over the Trinity River, due to diversion of funds to the north portion. By the late 1950s, a bypass to the east of the downtown section was planned. By the time construction reached Hutchins, in about 1955, the state decided to build further segments to full freeway standards. By 1961, the freeway was complete between Hutchins and the State Highway 14 split at Richland, except for the bypass around Corsicana, which was built ca. 1964. This freeway was mostly built along the existing US 75; one of the projects in Navarro County, near Corsicana, was the first Interstate project in Texas approved under the Federal-Aid Highway Act of 1956. It was not until 1964 that I-345, extending I-45 north along the proposed Central Expressway bypass, was added as a proposed state highway. I-45 and I-345 were built and opened in the 1970s, with the final section, between Lamar Street (exit 283A) and the Central Expressway (exit 283B), opening on February 25, 1976. At the north end, before it merged into the Central Expressway (which continued to carry US 75), I-345 straddled the bridges over Bryan Street and Ross Avenue, the latter the location of the opening ceremonies in 1949. Because of their location, these two bridges were not replaced in the 1990s reconstruction of the North Central Expressway, and are the only surviving grade separations from the initial construction north from downtown. At the time the interchange with I-20 was built, the freeway that crossed I-45 was then a part of I-635; it would not be until later when, initially, I-20 was added to I-635 as a multiplex, then later still, I-635 would be truncated away from the I-45 interchange (back around to just north of what is now I-20's interchange with US 175). Reconstruction and widening to six lanes, from the Ellis-Navarro county line (between exits 243 and 244) north to State Highway 310 (exit 275), began in 1991. The last section, near the north end, was completed in 2002. ^ "Houston Streetcars - Galveston-Houston Interurban". Retrieved 4 October 2014. ^ Satellite image of Gulf Freeway and Interstate 610 interchange. Google Maps. Last accessed September 25, 2006. ^ Clearing up confusion of multiple highway names Houston Chronicle, November 20, 2005. ^ Bureau of Public Roads & American Association of State Highway Officials (November 11, 1926). United States System of Highways Adopted for Uniform Marking by the American Association of State Highway Officials (Map). 1:7,000,000. Washington, DC: U.S. Geological Survey. OCLC 32889555. Retrieved November 7, 2013 – via University of North Texas Libraries. ^ a b c d e f g h i j Slotboom, Erik (2003). "Chapter 4: The Spokes". Houston Freeways: A Historical and Visual Journey. Oscar F. "Erik" Slotboom. ISBN 0-9741605-3-9. ^ Slotboom, Erik (2003). "Chapter 5: The Loops". Houston Freeways: A Historical and Visual Journey. Oscar F. "Erik" Slotboom. ISBN 0-9741605-3-9. ^ a b Slotboom, Erik (2003). "Chapter 6: Freeway Mass Transit". Houston Freeways: A Historical and Visual Journey. Oscar F. "Erik" Slotboom. ISBN 0-9741605-3-9. ^ Dana Guthrie (May 27, 2011). "Gulf Freeway construction to begin this summer". Your Houston News. Retrieved June 29, 2011. ^ Woods, Eric (June 28, 2011). "I-45 corridor work kicks off summer travel season". Ultimate Clear Lake. Archived from the original on July 5, 2011. Retrieved July 6, 2011. ^ Slotboom, Erik (2003). "Chapter 1: Building the System". 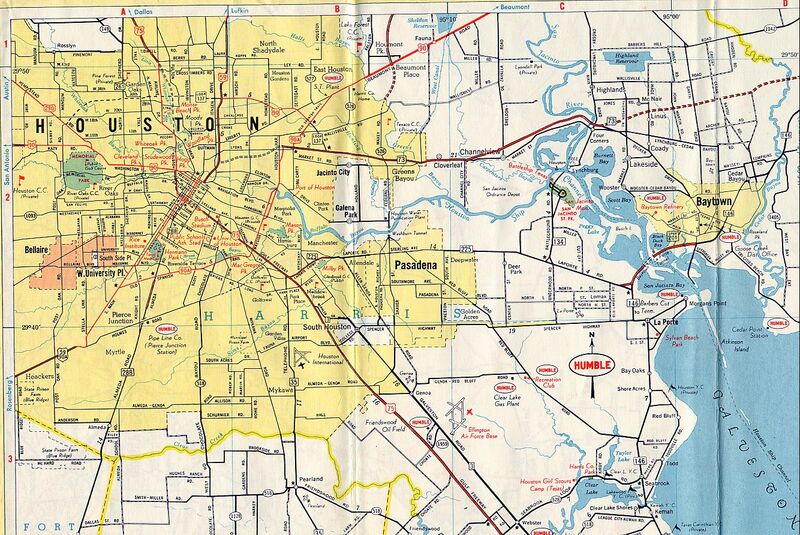 Houston Freeways: A Historical and Visual Journey. Oscar F. "Erik" Slotboom. ISBN 0-9741605-3-9. ^ Slotboom, Erik (2003). "Chapter 3: Downtown Freeways". Houston Freeways: A Historical and Visual Journey. Oscar F. "Erik" Slotboom. ISBN 0-9741605-3-9. ^ Texas Department of Transportation Highway Designation Files, "Interstate Highway No. 20", March 12, 2010. Retrieved 2010-07-21. ^ Texas Department of Transportation Highway Designation Files, "Interstate Highway No. 635", March 12, 2010. Retrieved 2010-07-21. ^ a b "City of Huntsville, Walker County officials discuss I-14 project". The Huntsville Item. September 2, 2016. ^ a b "S.M. Wright Project". Texas Department of Transportation. Retrieved March 8, 2018. Wikimedia Commons has media related to Interstate 45. This page was last edited on 15 April 2019, at 18:47 (UTC).